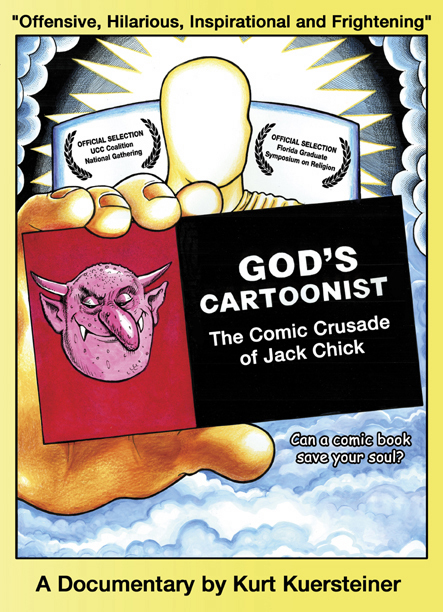 God's Cartoonist: The Comic Crusade of Jack Chick-- a documentary film by Kurt Kuersteiner. Combo Deal: Consider ordering the film together with the official companion book for 20% off! It's here! The first and only documentary on the world's most published cartoonist! This film includes interviews with all the major players in Chick's comic book empire (except Chick himself, who won't appear on camera out of fear for his safety). Included in the film are Fred Carter (Chick's only co-artist), Rebecca Brown (Chick's spiritual warfare guru), Alberto's widow (Nury Rivera), Kent Hovind (before he went to jail), Cowboy Chaplain Dann (the "human tract dispenser"), Chick assistant David Daniels, Artist Hal Robins, conspiracy expert Ivan Stang, and authors of separate books about Chick (Bob Fowler of The World of Jack Chick and Dan Raeburn The Imp #2). The film was directed by Kurt Kuersteiner, the author of the most recent book on Chick (The Art of Jack T. Chick). It also includes archival recordings and videos of Alberto Rivera and John Todd, two of Chick's most inspirational and controversial Illuminati / Vatican conspiracy sources. It's informative, thought provoking, and fun to watch. Love him or hate him, you can't resist reading Chick tracts, or ignore this ultimate "Chick flick"! Total running time is 77 minutes, plus an extra 20 minutes of deleted scenes and other DVD extras. COST: Just $14.95 plus $2 postage in the USA. EXTRA BONUS! 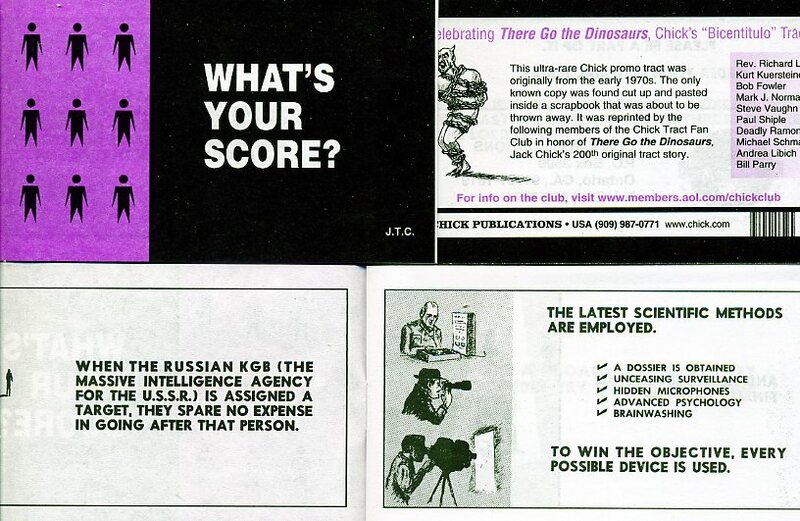 You'll also get an exclusive reprint from the only known copy of What's Your Score, a rare and long lost promo tract from the 1970s! It was recenty produced by the Chick Tract Club (and printed by Chick Publications) in celebration of Chick's 200th tract story! Order now: Boxed DVDs are in stock and ship weekly. Consider ordering the Companion book alone.